Honiton A rare phenomenon normally associated with Scandinavia has been recorded on a British river. 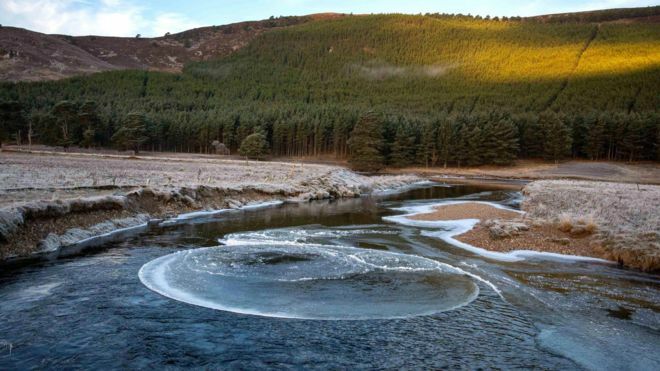 A giant, spinning disc of ice was seen on the Otter, near Honiton, Devon, by Roy Jefferies, who was walking his dog on the bank during the recent cold snap. He was amazed by the slowly rotating, 10ft wide, perfectly circular object, which was stationary in the current close to where a stream joined the river. Graham Blissett, who also saw the disc, said that they were very rare. He had never heard of one in Britain before. In Sweden ice discs 200 metres across have been recorded. The lake contains rare fresh water seals and several species of fish found nowhere else on the planet. They told the story of a man who found a perfect circle of ice slowly spinning in a river and investigated how it happens, and it's a perfectly natural phenomenon. Ice circles or ice discs are apparently best known in Scandinavia and other high-latitude regions. ... in the crop circles thread. 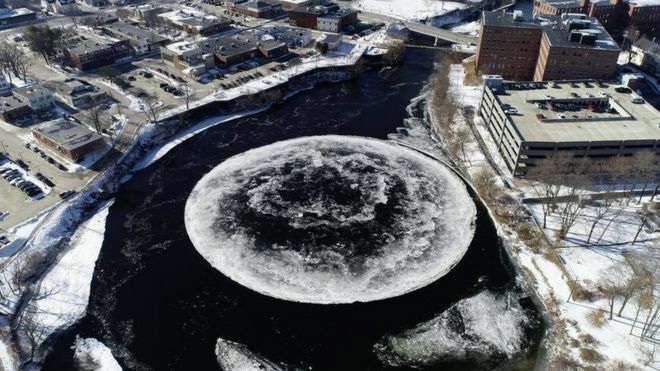 A giant spinning circle of ice has been spotted in a river in the US. Experts say the phenomenon is extremely rare but entirely natural. Ace, I've not seen a video of one moving before ... thanks. Wow. That genuinely is pretty impressive. I once saw a rotating ice disk in a brook in the Czech Republic. It was 20 cm in diameter. Aberdeenshire's turn for a giant ice pancake. Presumpscot River, Maine, USA. ~91m diameter. Typical Americans, have to supersize everything. Looks like the moon in a bucket! A very big bucket. It seemed like harmless fun at the time tribble but when you punch ice so your other half can take interesting photos? .. ice can cut your hand, my scabs are mostly healed now and I won't be doing that again without gloves .. lesson learned. I recommend 'Working Hands' ointment for that. I recommend not punching ice in the first place. Listen to Tribble. Punching ice is not big or clever. The big ice circle that formed in Maine (see post #13) is shrinking and disintegrating due to unseasonably warm temperatures. Maine’s giant spinning ice disk may soon meet its end because of unseasonably warm weather. A very strange ice circle has been reported in Qinghai, China. This one looking like a combination of a crop circle and an ice circle. China News reports an Ice Circle. Would the Zetas explain its meaning, and why the switchover to ice from crops? Does this also imply crop shortages? [and from another] / Hu Guilong Figure / Hengxiu Mai Tian Quan? posts us news of this very exciting ice circle in Qinghai, China. Great aerial photos from: chinanews.com [and from another] https://www.chinanews.com/tp/hd2011/2019/04-12/877218.shtml The mysterious figure of Qinghai Lake is not known. On April 12th, a giant mysterious figure appeared on the ice on the south side of Haitai, Qinghai Lake Erlang Sword Festival. According to the photographer, Qing Xiu, Qinghai Lake Tourism Group Co., Ltd., the deputy general Heng Xiu introduced the picture that was taken at 11 o'clock on the same day, the area is more than 100 square meters, the specific reasons for the Circle are unknown. I like that. Probably easier to make than a crop circle, too. You could make this with string, pegs and a salt spreading machine. Or orbital laser, whichever is to hand. Impressive isn't it? Here's another image from higher up giving a better idea of it's actual proportions. See just how big this thing is! A very strange ice circle has been reported in Qinghai, China. According to this short video, it's similar to car manufacturer AION's logo & is a publicity stunt..